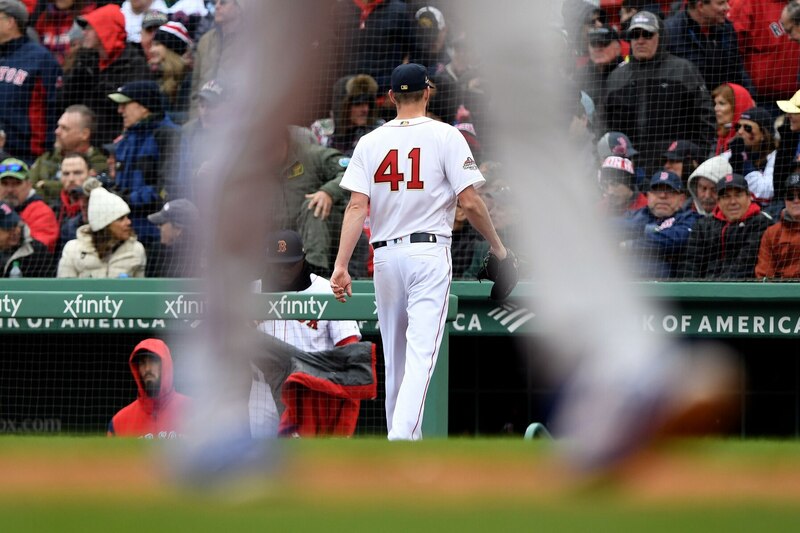 Chris Sale took the mound for the Boston Red Sox in their home opener on Tuesday. It did not go well. The outing was short and ineffective. He allowed five runs in four innings. It was Sale’s second rough start in only three outings. This is something that, as Marly Rivera of ESPN noted, rarely happened to him over the 2017 and 2018 seasons. Per @ESPNStatsInfo Chris Sale has given up 5+ ER in less than 5 IP in two of his first three starts this season. He did that only twice in his first two seasons with the #RedSox. The first thing to look at is Sale’s fastball velocity: It’s down, and not by a small amount. This was really noticeable in Sale’s second start of the season. While he actually found a way to have a nice outing (albeit in a losing effort), Sale was not even hitting 90 on the gun. It was the first time in Sale’s career where he went six or more innings while failing to strike out multiple hitters. And keep in mind, this was against the Oakland Athletics, a team usually vulnerable to the K.
Manager Alex Cora attributed (per Chris Cotillo, MassLive.com) the low velocity in Oakland to Sale being sick before the start. That checked out, but only to a degree. His velocity was better on Tuesday, but still well below the norm. As John Lott of The Athletic reported, Sale had a four-seam fastball velocity of 95.7 and a two-seam velocity of 93.1 in 2018. On Tuesday, they clocked in at 91.8 and 90.7, respectively. Obviously, fastball velocity is darn important. A good fastball lets a pitcher get away with a lot more. It also makes the other pitches look much better. That said, the dip in velocity is not the only change worth mentioning. For his first two years with the Red Sox, Sandy Leon was his primary catcher. This year, it’s been Christian Vazquez: And if we look at the last two seasons, we could have seen at least some regression coming. Over the 2017 and 2018 seasons, Sale posted a 2.42 ERA and 0.90 WHIP when throwing to Leon. Throwing to Vaquez, he had a 3.40 ERA and 1.08 WHIP. Granted, the numbers to Vazquez aren’t bad. In fact, when we factor in how many more innings he threw to Leon (319.1) to Vazquez (53), we could make the case that there’s little difference. But some of the peripherals tell a different story. Sale’s BB/9 rate was much higher throwing to Vazquez (2.5) than Leon (1.7). Conversely, his K/9 rate was much lower (10.9 with Vazquez, 13.6 with Leon). The intention is not to knock Vazquez. But a pitcher throwing better to a specific catcher is pretty common in baseball. We’ve seen it recently with Jon Lester and David Ross or Clayton Kershaw and A.J. Ellis. Going back a generation, we saw it with Greg Maddux and Eddie Perez. Having good chemistry with the man you’re throwing to is important. Granted, over time, a top-tier pitcher should be good enough to overcome a catching change. But that coupled with a dip in velocity makes regaining his prior form an even more challenging task for Sale. Whatever the cause, something is clearly off with Sale: Through three starts, he has a 9.00 ERA, a 1.54 WHIP, a 5.5 K/9 rate, and a 2.8 BB/9 rate. We could attribute some of that to it being early in the season. Certainly, it’s not uncommon for pitchers to start slow while they build their arms up. But these struggles go beyond the typical early-season issues that sometimes plague pitchers. The struggles would still be notable if Sale was hitting his regular velocity but just missing some spots. But there wouldn’t be much of a need to worry long term. But this is different. Worse, it’s clearly hurting Sale’s focus. The good news is that there’s plenty of time for Sale to find his form. The bad news? It’s pretty tough to find reasons for great optimism.